Is Sunday's El Clasico a must-win game for Real Madrid? 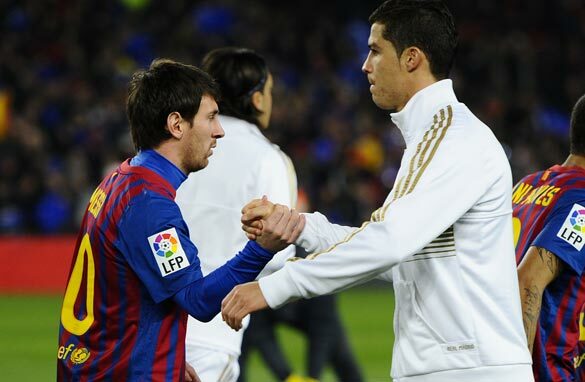 Lionel Messi and Cristiano Ronaldo will take center stage during Sunday's El Clasico. “No. Not at all”. That’s what Real Madrid coach Jose Mourinho said when I asked him if Sunday’s El Clasico was a must-win match for the champions. In an exclusive interview with CNN, the Portuguese coach told me he believes it is way too early for the league to be decided, even if Real are currently eight points behind Barcelona. Do you agree? In my mind, this Clasico will only have a real bearing on the title race if Barcelona win. If that happens, the gap will increase to 11 points and that is a huge difference, especially if you consider that both Barcelona and Real usually win a large portion of their matches. As far as making a prediction, I honestly think it is too close to call. Although Barcelona are at the top of the table right now, I would be reluctant to say they are overwhelming favorites for this weekend’s clash at the Camp Nou. Yes, they have won all of their league games, yes they are playing at home, but the Catalans haven’t really convinced me so far, and they have serious defensive problems to resolve. It is a distinct possibility Barca coach Tito Vilanova will have to start Sunday’s clash with Javier Mascherano and Alex Song as centre backs. Carles Puyol is out for two months after dislocating his elbow in Tuesday's win over Benfica in the Champions League, Gerard Pique is still struggling with a foot injury, and Vilanova hasn’t given any minutes to the kids from the academy. If Mascherano and Song play, the Catalans will be very vulnerable at the back. As we saw against Sevilla, this is a partnership which lacks expertise and experience, and I can assure you that Real will definitely aim to take advantage of that. As far as Los Blancos are concerned, a lot has been said about an alleged rift between Mourinho and Sergio Ramos. After spending a few hours with the “Special One” last week, I can tell you the situation has been exponentially exaggerated by journalists who would like to see the Portuguese manager out of the club. Is there an issue? Yes. Mourinho and Ramos don’t see eye-to-eye when it comes to football philosophy and communication strategy, but how many times have you seen managers and star players disagree? And how many times has it actually affected the team’s performances on the pitch? Not everyone can be best friends and I can assure you Mourinho will not allow this situation to get out of control, even if Real lose Sunday’s game. A final word on the rivalry between Leo Messi and Cristiano Ronaldo. The Argentine phenomenon had started the season on fire but has since been overtaken by his Portuguese counterpart when it comes to goals scored. Right now Messi has 10 goals in 10 games and Cristiano boasts 12 in 10. Whatever the outcome of his weekend’s Clasico, I can assure you it will be as exciting and intense as ever. For Real it may not be a “must-win” match, but it is also one they can’t afford to lose. It Is not a must win game. So this eliminates Some Pressure of Real Madrid. Right Now CR7 is Playing Great. Real need to win to keep up in the League, but after losing the supercup, I am sure Barca "needs" the victory too :). To me Barcelona is better team , but Real still need more time to be a better team. Now Barcelona don't have a great coach, but I like to see play with the ball for 89 minutes. Messi is the best, the rest are onemore in the field. I think Real Madrid will win, I think they are starting to hit top form now and so is Ronaldo. I actually think there will be lots of goals in this match, as both defences have been fragile so far, so I think Real Madrid will win 3-2 tomorrow night. Ye! Go real madrid. Am sure cr will make an impact. I'm astonished by the thousands of times that Youtube repeated the Mou interview. Do u really think that is worth of?? Your friendship with Mou is only up to you...once is enough!!! Pinto, please let us rest of your interview with Mou...Once is enough, don't repeat It thousands of times....thanks.. The people(Pedro Pinto) who supports RM will definitely oppose Barca. Pedro it is now clear that you clearly supports RM in every manner. Only pointing out Barca's weaknesses. Cant you see how tight they are in midfield and RM are always loosing ball in MF. This is how you predict the match. Yes, this is a must win game for RM to boost their morale against their fierce rivals. I hope Barca will see off them 2-0 or it will be a draw. Pedro I must confess that your articles on Real/Barca are always biased in favour of madrid especially now that You and Mourinho seemed to have overcome your problems...I wonder what u would have said if Barca was 8points behind Real.That said,the game was a draw and I am sure Ronaldo was your man of the match...But I have no doubt in my mind like most peole who watch footbal that Lionel Messi is the best footballer that has ever lived and one thing I like very much about him is his childlike humility...Ronaldo and Mourinho should learn from him. A 2-2 draw was a fair result. One thought there was less of tiki-taka on Sunday. The goals by Ronaldo and Messi gave no chance to Victor Valdez and Iker Casillas. Without the injured Carles Pujol, Gerrard Pique and Dani Alves, Barça were able to deny CR7 further successes. Well played.